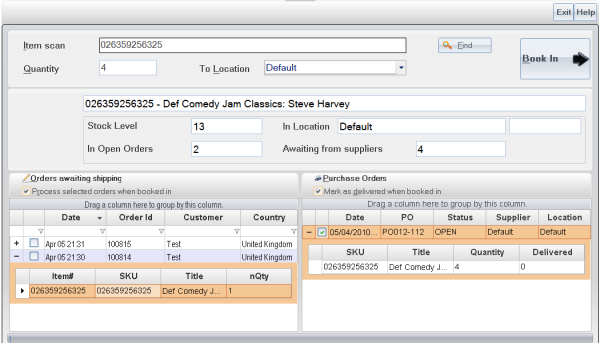 The Stock In screen is used to book newly arriving stock into the system. This functionality allows you to scan SKU or barcodes in the dedicated screen and add the items to your stock. Most commonly this functionality is used to scan products in when you accept a delivery of goods from a supplier. The system automatically shows you all Purchase Orders where this stock item is currently registered as being on order from supplier and lets you register this item as delivered against a specific Purchase Order. When a product is scanned in the system also displays all Open Orders which have this product on order. To book the stock item into stock and mark it of as delivered from a specific purchase order- make sure the Mark as Delivered when booked in is turned on, tick the purchase order which you are marking as delivered (click on + sign to expand the line to see all stock items in the purchase order). if the delivery location of the purchase order does not match To Location selected the system will no proceed and error prompt will be shown. The order of marking of as delivered is from oldest purchase order to newest. For example if you have two purchase orders with 5 products on order in each and you are booking in 7 into stock, when both purchase orders are selected - the system will mark 5 as delivered in the older PO of the two and marks of 3 as delivered in the newer one.